Belgium - Barco has expanded its projector portfolio with a cost-effective single-chip DLP projector producing 12,000 center lumens light output. The brand-new RLS-W12 offers WUXGA (1,920 x 1,200) resolution, extended warping and blending, and HDBaseT technology to provide video over a single Cat 5 cable. 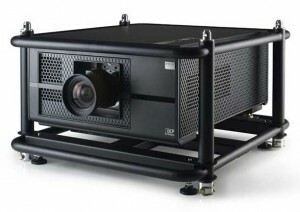 This new projector is the perfect choice for small- to medium-sized venues, and its optional rental frame makes it equally suited for the rental and staging market as well. The projector will be commercially available from December 2014 onwards. "Our RLS-W12 projector is a smart choice for customers who are looking for a cost-effective projector that delivers the brightness needed for large screens," comments Richard Marples, strategic market director venues and hospitality at Barco. "Designed for fixed installation in museums, theaters and conference auditoriums, it’s also ideally suited for the hotel and exhibition rental market thanks to its rugged design, extended warping and blending functionalities, and optional rental frame. Following our RLM-W14 projector, which was launched last September, we’ve also integrated HDBaseTTM into the new RLS-W12 to satisfy growing market demand for this technology." Featuring both HDBaseTTM and BarcoLink technology, the RLS-W12 supports point-to-point transmission of video signals – up to WUXGA (1,920 x 1,200) at 60 Hz – from source to projector, over distances of more than 70 meters, via a single Cat 5 cable or a single BNC cable. By eliminating the need for multiple expensive cables and connectors, these technologies provide greater simplicity, flexibility and lower installation costs. Offering high-quality images with stunning brightness levels, the RLS-W12 features a rugged design that reduces noise and minimizes power consumption. It achieves its 12,000 center lumens with twin 465W NSH lamps, which – in addition to being very affordable – provide long lifetime. What’s more, the RLS-W12 operates at full brightness on a voltage range of 110V - 240V, so that users who are based in the US or Japan won’t require an extra adaptor to use it. The RLS-W12 can be easily controlled in multiple ways: via the new wired or wireless remote control, the projector control app for Android and iOS devices, and the user-friendly Barco Projector Toolset software. This software ensures simple operation and management of all Barco event projectors via one straightforward tool.